The Faculty of Information Technology was established in 2001 by turning the two departments of Computer Science and Computer Information Systems from the Faculty of Arts and Sciences into an independent Faculty, thus creating a unique edifice of information technology and systems. This decision emerged out of an academic vision aimed at graduating a generation armed with a scientific and theoretical methodology in view of the rapid developments witnessed by local and international markets in this field. The Faculty is keen on selecting elite professors in computer science, computer information systems, software engineering, and similar fields, professors who have done research and gained diverse experiences at international and prestigious universities. In addition to the outstanding credentials of its professors, the Faculty sponsors other services and facilities to enhance the IT sector of the local market, so as to bridge the gap between academic education and market needs. This is accomplished through providing consultations and software solutions and by organizing and hosting local and international IT-related activities. 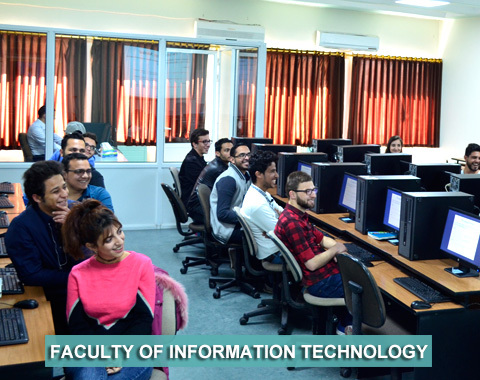 The Faculty of Information Technology at Al-Ahliyya Amman University aspires to be the national and regional pioneer in providing excellent education, scientific research, and knowledge building in the fields of computing and informatics. Our mission is to provide a creative learning in an educational environment which copes with the latest developments in the field of technology and knowledge. We aim to achieve quality assurance standards that fulfill the requirements of the national and international accreditation to achieve high quality outputs appropriate to the labor market needs. Furthermore, we aim to stimulate scientific research and to promote cooperation with the local community. Excellence: continuous aspiration to achieve educational excellence. Teamwork: working as an integrated team to attain the common goals. Focus: effectively utilizing the faculty resources to promote innovative research capable of facing real-world challenges. Integrity: fostering individual and institutional integrity. Creativity: fostering the spirit of creativity among our graduates.